Over the years, popular Buddhism has absorbed a number of Hindu customs together with a galaxy of local gods. The awesome of these deities is the god Skandha or Katharagama whose shrine is in the deep south. Katharagama is a terrifying figure, and he exacts a heavy price from those whose petitions He grants. Those who have been cured of grave illnesses, or whose prayers for children have been answered, must redeem their vows with an offering of pain. Sometimes they have to walk across burning coals, but the most common penitence is to be dragged around the streets swinging from a bar to which they are attached by savage iron hooks struck into the flesh of their backs. f any single day in the Buddhist calender is of equal importance to the Christmas day in Christian calender, it has to be the day of Wesak. All over the country, temples in the villages and cities announce the dawn of Wesak, with peals of bells and drum beats. Shops selling large and small lanterns, candles, various electric lighting sets, and papers of any imaginable color abound. The devout, clad in pure white, with no make-up or jewelry, make their way to the temple to spend the next twenty four hours in quiet contemplation. No solid food is taken after mid-day meal on this day. 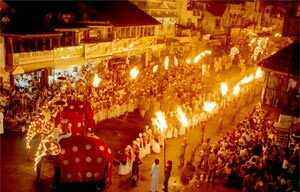 New Year , which is celebrated about the 13th - 14th of April, is a very special time in Sri Lanka. The larders are full since the harvest has just been collected, the trees are full of flowers, the homes are freshly painted and it is time for festivities. Everything during this time must be performed at precise times (nakatha), and in the prescribed way. The lighting first fire in the hearth, start of work, first transaction, first application of oil to hair, first meal, to name a few.